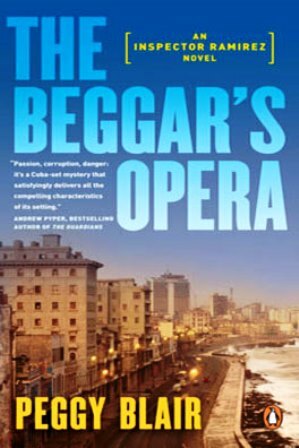 Let me talk to you about Peggy Blair, or rather her first book The Beggar’s Opera (Midnight in Havana in the UK.) Blair has set up a premise that would seem difficult to pull off. She does. And not just pull off; she eases us into the premise with an ‘of course’ familiarity that expects us to just move along with it. We do. It’s the mark of a gifted author and the reason why Blair now has a few books in her repertoire. Book two, The Poisoned Pawn was published in February 2013. Her third, Hungry Ghosts is waiting in the wings along with her fourth (unnamed) and are to be released by an undisclosed publisher. Inspector Ricardo Ramirez sees the murdered dead. They come to him to solve their killing and are mute, silent, unspeaking. However, they are not without expression and they want only one thing – justice. As Ramirez goes about his daily life as the head of the Major Crimes Unit for the Cuban Revolutionary Police an unsolved murder victim is always one step behind him. Is he going insane? Canadian police officer Mike Ellis is on vacation in Cuba with his wife. It’s an attempt to save their dissolving marriage. A chance meeting with a street youth, later found murdered, is brought to Ellis’ hotel doorstep when evidence is found in his room leading police to believe he is the killer. The book is a love story to Cuba in its way and introduces compelling characters and story lines that come together in interesting ways. It is a very fine and atmospheric read. Thanks for the lovely review, June Lorraine, much appreciated! It’s well deserved Peggy, I’ll be on to your next book in the next few weeks.Thanks for taking the time to comment. So glad to hear that. I’ve touched base with Peggy on her site and she is so nice to deal with. Let me know what you think Vicki, I found it a very interesting book with a good pace and nice story lines.